As Sicario overplays its quest to underplay itself, we arrive at a confused portrait of profound dysfunction. That may be an appropriate angle to take on another of America’s unwinnable wars (in this case the drugs and border war with Mexico), or may be something less. There are darkly exhilarating action scenes with satisfyingly delineated physics, reminiscent of the Scott brothers (take your pick: Riddley’s Blackhawk Down or Tony’s Man On Fire), but the bigger picture is murky. Nobody’s agenda seems tenable, unless the goal is to perpetuate a state of war. Going black-ops to “cut the head off the snake”, seems only to lead to revitalised bloodshed among the survivors. If finding the real head of the snake might involve some of the characters looking in a mirror, the film appears to have no concern with that. As for decriminalisation as a response to industrialised crime, forget it. The personal journeys of the revenge obsessed sicario (Benicio del Toro) and the law-and-order-loving ingenue (Emily Blunt) seem similarly futile. The sicario (meaning hitman and/or zealot), achieves a personal goal but the characters encounter a textbook story snag – they don’t change. This is exacerbated by switching focus between them in the third act and withdrawing from the political to the personal for resolution (as if from Blackhawk Down to Deathwish 5). A movie about something as politically charged as the war on drugs that takes no apparent position on it is walking shaky ground. 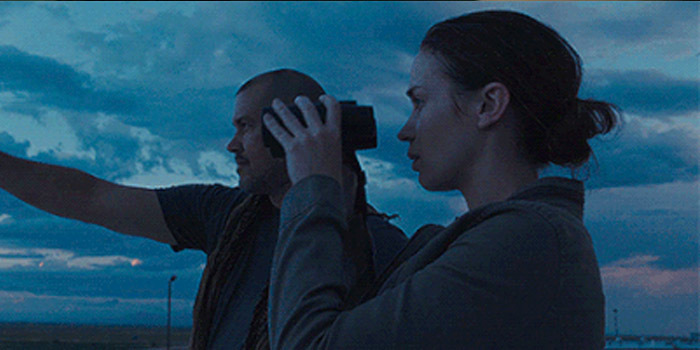 Sicario could have achieved a meaningful ambiguity but winds up at best a dark slice of life. Intentionally or otherwise, its lack of self examination sees it drifting uncomfortably near to xenophobic flag waving.